Only days before it was set to premier on Al Jazeera English earlier this month, a new film on the nonviolent movement in West Papua was pulled off air by the Qatar-based TV channel – apparently at the behest of the Indonesian government. Called “Pride of Warriors,” the documentary was inspired by the arrival of 43 West Papuan refugees in Australia in January 2006. 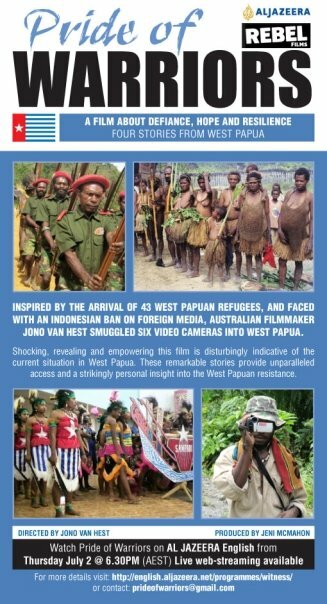 Faced with an Indonesian ban on foreign media, [Australian filmmaker Jono] van Hest smuggled six video cameras into West Papua. The result of this unparalleled access into the West Papuan resistance is a film that gets behind the media headlines to give an upfront and personal account of nonviolent resistance in West Papua. The film tells the stories of four individuals: Yani, the daughter of an independence leader, who was kidnapped and tortured because of her father’s nonviolent political activity; Matias Bunai, a customary leader from Paniai who is fighting to keep his culture alive; the rebel leader Tadius Yogi who has put down his guns and now advocates a peaceful solution to the conflict; and a group of young dancers who were interrogated by the Indonesian security forces for performing a dance. By refusing to screen his film Al Jazeera has come down on the side of a withering of democracy. When it is eventually premiered, Pride of Warriors promises to blend the best of art, politics and investigative journalism. The very act of filming is itself a story of nonviolent action and solidarity with a people determined to be free, highlighting the power of the video camera as a tool for liberation. In the Jakarta Post, Ary Hermawan suggests that the film was canceled, or at least postponed, because the presidential elections were approaching on July 8, and the Indonesian government saw the documentary as threatening. While it’s perhaps not surprising, I guess this is just evidence that when it comes to being critical of Muslim countries, Al Jazeera is not as independent as you’d hope. Because there could be no other possible explanation for this than a shared religion? Brilliant reasoning, really. You make a good point. It could be something else. What other possible explanations do you have? I said that mainly thinking of the documentary Control Room, that showed the courage of Al Jazeera at the beginning of the Iraq War, and the channel’s general willingness to critique the West, which I admire. But would they have pulled a documentary critical of some aspect of US foreign policy if officials in Washington were upset? I doubt it. I just think they would garner more respect if they were also willing to take on the misdeeds of Muslim countries, and this seemed to be one opportunity for that. See, the thing is that I didn’t write this piece, so I don’t have to give arguments to prove that al Jazeera is independent when it comes to criticizing ‘Muslim countries'(because I don’t know if they are or aren’t). It’s up to you (the writer) to give arguments / proof that they are not. The fact that they didn’t (yet) air ONE documentary, SUPPOSEDLY (not confirmed, it’s a SUGGESTION by a journalist) because the regime asked them to pull it, is no basis for the conclusion of your piece. And that’s what troubles me here – that a sad incidence (pulling a documentary on an important subject) becomes fodder for a quick judgment based on assumptions about a news-station.